• Good Sportsmanship is expected and required of all players, coaches, parents and spectators. All league, association and US Lacrosse rules will be strictly enforced. • All players will treat their own teammates and their opponents with respect. Players will not criticize their teammates, but they will be courteous, supportive and cheer them on. • All Players will treat their coaches with respect. Coach's decisions are final and will be adhered to by players. Practices: 10 minutes prior to start be dressed and ready by the start of practice! Players arriving late for games may be penalized with loss of playing time at the sole discretion of the head coach. The Head Coach should be notified as far in advance as possible. Each team will be expected to have sufficient lists of phone numbers for players to contact coaches or the manager regarding attendance. All FCYL players and coaches are expected to have a clear understanding of the rules of Lacrosse as outlined in the US Lacrosse publication of the same name and to abide by and honor those rules during all practices and games. a.) 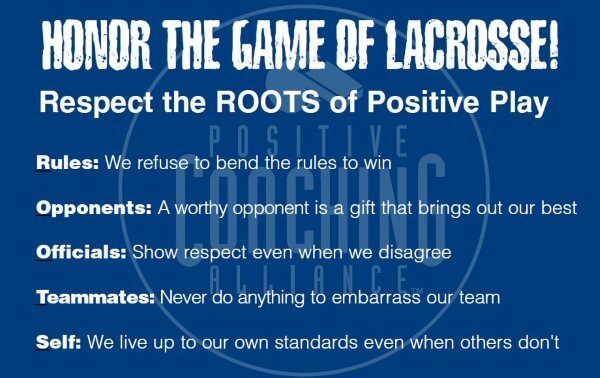 Know the rules of Lacrosse and respect them. and work hard during that practice. • Attend all practices possible and let your coaches know if you will not be there. • Don't criticize your teammates. • Let the coaches coach! Parents shall not approach coaches before, during or after games or practices for a period of 24 hours to discuss the game or play therein. Congratulations and other remarks are appropriate but DO NOT discuss issues when emotions are high. • Fighting, of any kind , will not be tolerated on or off the field. The Disciplinary Committee in accordance with the rules of US Lacrosse, and the CCL and the FCYL Code of Conduct will deal with any infraction swiftly. Abusive language, violent conduct, disrespect of coaches, officials and peers is not acceptable and will not be tolerated. The coach will handle such problems with the players/parents directly but if the problem continues, the Disciplinary Committee may suspend the player from the team. Refunds for time lost due to these infractions will not be granted. The FCYL Board has adopted a ZERO TOLERANCE POLICY in connection with any adult behavior that is quite simply, inappropriate. These actions include but are not limited to the following; approaching a coach during a game; confronting a coach on the field or bench during a game or practice; any violation of the FCYL 24 Hour rule. The Disciplinary Committee may deal with the problem and can ban adults from the fields due to inappropriate behavior. The Disciplinary Committee may also remove the parent and their player from the association with no refund. The Committee may also call parents in for a meeting at any time. First time violations will receive a letter from the Disciplinary Committee. There are circumstances for which a personal appearance before the committee will be required. Step one is to talk with your Team Manager. If no resolution is forthcoming, call one of the BOD members. If further resolution is required the representative can take the matter to the Disciplinary Committee, or the full Board of Directors, but expect that the first question asked will be whether or not you discussed the matter with your team manager and coach first. These FCYL CODE OF CONDUCT rules cannot be all inclusive. Communication with you team manager, age level Representative or any member of the Board can resolve problems or questions quickly. In short, if you're unsure, ASK ! • Always act appropriately. Do not taunt or disturb other fans. • Officials and coaches are OFF LIMITS before, during and after a game. • NEVER, EVER abuse a player or coach either physically or verbally. • Emphasize the development of skills and the practice needed to develop those skills. • Applaud a good effort in victory AND defeat! • When you have a problem or concern follow the proper lines of authority to solve the problem. Simply put, start with your team manager - NOT THE COACH!. They will direct you to the proper person to get the problem resolved. • Understand and support the rules of US Lacrosse the League, and the association.